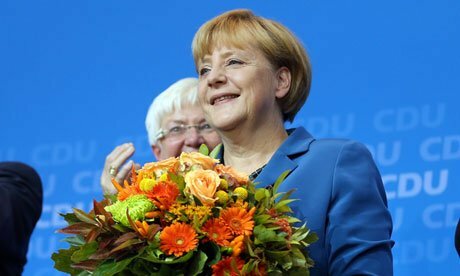 German Chancellor Angela Merkel has urged her party to celebrate “a super result” after exit polls suggested CDU was set to win a third term. Angela Merkel’s Christian Democrats took about 42% of the vote, according to exit polls. But Angela Merkel’s preferred coalition is at risk, as her Free Democrat partners appear not have secured the 5% needed to enter parliament. She may, therefore, be forced to seek a grand coalition with the Social Democrats (SPD) – estimated to have won 26%. Exit polls for ARD public television put the liberal Free Democrats (FDP) on 4.7%, which if confirmed would be a disaster for the junior coalition partner, leaving it with no national representation in parliament. Senior party member Christian Lindner called it “the bitterest hour”. The FDP was beaten by the Green Party (8%) and the former communist Left Party (8.5%), and even, according to exit polls, the new Alternative fuer Deutschland, which advocates withdrawal from the euro currency and took 4.9%, just short of the parliamentary threshold. There was some speculation on German television that the Christian Democrats (CDU) might even win enough seats for an absolute majority – the first in half a century – if both the FDP and AfD fail to make it into parliament. In a reference to coalition building, Angela Merkel said it was “too early to say exactly what we’ll do”. “We have a clear mandate from voters to form a government,” said Volker Kauder, leader of the CDU’s parliamentary group. The outcome showed that “voters want Angela Merkel to remain chancellor” for a third term, he said. Angela Merkel has made clear she would be prepared to work with the SPD in a grand coalition, as she did in 2005-2009. The SPD has been more reluctant to consider linking up with the CDU again. The party leader, Peer Steinbrueck, was finance minister in the previous grand coalition, but has said he would not serve in such a government again. The SPD would have preferred to enter a coalition with the Green Party, but does not appear to have the votes to do so, and has ruled out a three-way alliance including the Left Party (Die Linke). Analysts think the SPD will probably agree to a coalition with the CDU. Turnout appeared to be higher than at the last federal election. At 14:00 it measured 41.4% of eligible voters, compared to 36.1% at the same point in 2009.